An ancient Ayurvedic proverb goes, “when diet is wrong, medicine is of no use. When diet is correct, medicine is of no need.” As simple as that sounds, we often tend to ignore the fact that eating the right food can actually help curtail many health issues. 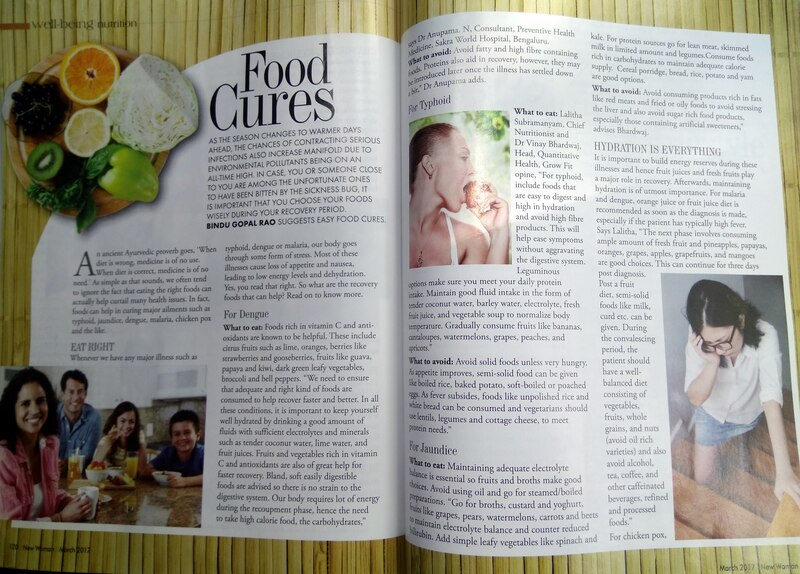 In fact food can help in major ailments such as typhoid, jaundice, dengue, malaria, chicken pox and the like. Yes, you read that right. So what are the recovery foods that can help? Read on to know more. Whenever we have any illness like typhoid, dengue or malaria, our body goes through some form of stress. Most of these illnesses cause loss of appetite and nausea, leading to low energy levels and dehydration. Foods rich in Vitamin C and antioxidants are known to be helpful. These include citrus fruits like lime, oranges, berries like strawberries and gooseberries, fruits like guava, papaya and kiwi, dark green leafy vegetables, broccoli and bell peppers. “We need to ensure that adequate and right kind of foods is taken to help recover faster and better. In all these conditions, it is required to keep yourself well hydrated by drinking good amount of fluids with sufficient electrolytes and minerals like tender coconut water, lime water, and fruit juices. Fruits and vegetables rich in vitamin C and antioxidants are also of great help for faster recovery. Bland, soft easily digestible foods are advised so no to strain the digestive system. Our body requires lot of energy during the recoupment phase, hence the need to take high calorie food, the carbohydrates. Avoid fatty and high fiber containing foods. Proteins also aid in recovery however, may be introduced a latter later once the illness has settled down a bit,” advices Dr. Anupama. N, Consultant – Preventive Health Medicine, Sakra World Hospital, Bengaluru. 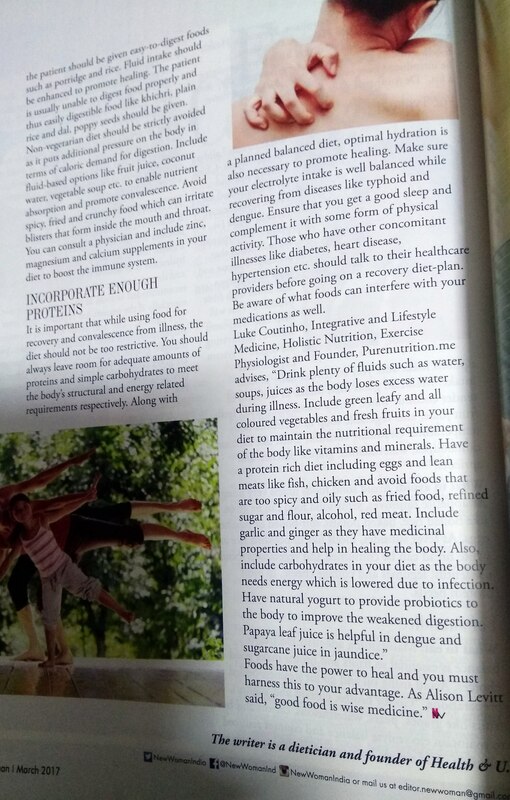 Lalitha Subramanyam, Chief Nutritionist and Dr. Vinay Bhardwaj, Head, Quantitative Health, Grow Fit opine, “for typhoid, include foods that are easy to digest and high in hydration and avoid high fibre products. This will help ease symptoms without aggravating the digestive system. Leguminous options make sure you meet your daily protein intake. Maintain good fluid intake in the form of tender coconut water, barley water, electrolyte, fresh fruit juice, and vegetable soup to normalize body temperature. Gradually consume fruits like bananas, cantaloupes, watermelons, grapes, peaches, and apricots. Avoid solid food unless very hungry. As appetite improves, semi-solid food can be given like boiled rice, baked potato, soft-boiled or poached eggs. As fever subsides, foods like unpolished rice and white bread can be consumed and vegetarians should use lentils, legumes and cottage cheese, to meet protein needs.” Likewise in case of jaundice, high fibre content should be avoided. Maintaining adequate electrolyte balance is essential so fruits and broths make good choices. Avoid using oil and go for steamed/boiled preparations. “Go for broths, custard and yogurt, fruits like grapes, pears, watermelons, carrots and beets to maintain electrolyte balance and counter reduced bilirubin. Add simple leafy vegetables like spinach and kale. For protein sources go for lean meat, skimmed milk in limited amount and legumes. Consume foods rich in carbohydrates to maintain adequate calorie supply. Cereal porridge, bread, rice, potato and yam are good options. Avoid consuming products high in fats like red meats and fried or oily foods to avoid stressing the liver and also avoid sugar rich food products, especially those containing artificial sweeteners,” advices Bhardwaj. It is important to build energy reserves during these illnesses and hence fruit juices and fresh fruits play a major role in recovery. Afterwards, maintaining hydration is of utmost importance. For Malaria and Dengue, orange juice or fruit juice diet is recommended as soon as the diagnosis is made, especially if the patient has typically high fever. Says Lalitha, “the next phase involves consuming ample amount of fresh fruit and pineapples, papayas, oranges, grapes, apples, grapefruits, and mangoes are good choices. This can continue for three days post diagnosis. Post fruit diet, semi-solid foods like milk, curd etc. can be given. During the convalescing period, the patient should have a well-balanced diet consisting of vegetables, fruits, whole grains, and nuts (avoid oil rich varieties) and also avoid alcohol, tea, coffee, and other caffeinated beverages, refined and processed foods.” For chicken pox, the patient should be given easy to digest food products for which porridge and plain rice work best. Fluid intake should be enhanced to promote healing. The patient is usually unable to digest food properly and thus easily digestible food like khichri, plain rice and dal, poppy seeds should be given. Non-vegetarian diet should be strictly avoided as it puts additional pressure on the body in terms of caloric demand for digestion. Include fluid based options like fruit juice, coconut water, vegetable soup etc. to enable nutrient absorption and promote convalescence. Avoid spicy, fried and crunchy food which can irritate blisters that form inside the mouth and throat. You can consult a physician and include zinc, magnesium and calcium supplements in your diet to boost the immune system. Previous Previous post: How Much Should You Praise Your Child?